One side effect of owning a cat for the better part of 18 years was a strict no-flowers-in-the-house rule. Yang loved nothing more than calmly sniffing a bouquet and then suddenly snatching a flower between his teeth, ready to chow down like a champion. When the husband brought home a gorgeous bouquet of lilies for Valentine’s Day, I actually left them at home instead of hiding them in the closet until I could secrete them away to the safer confines of my office. They were a lovely, colorful addition to the condo. During my next trip to Trader Joe’s, it occurred to me that people actually buy flowers for their homes, all the time, without holidays, birthdays or anniversaries as a prompt. 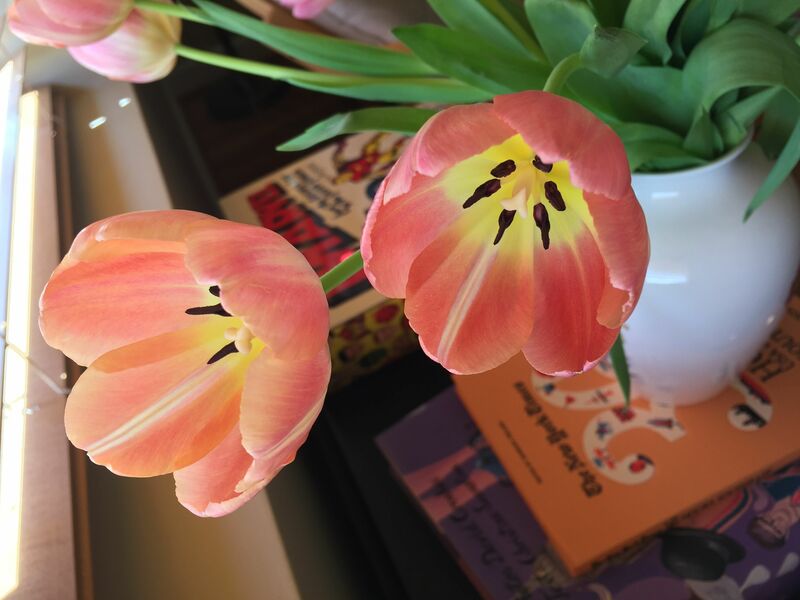 Five dollars later, I had the perfect little bouquet of tulips to add a touch of spring to the living room. It’s a small indulgence, but $5 every couple of weeks is money well spent to lift the mood of our small space. I’d trade them in an instant to have my cat back, though.